Looking for the perfect homemade barley vegetable soup recipe? You've found it! 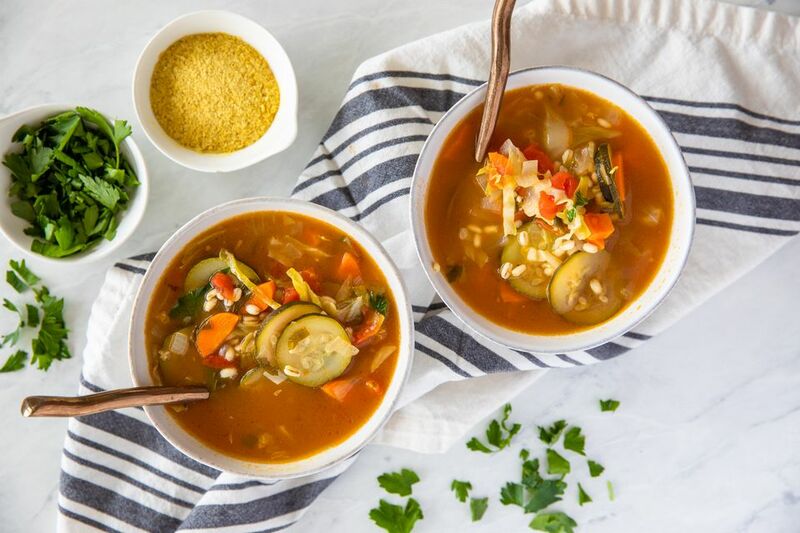 This simple and satisfying vegetarian and vegan barley soup recipe is made with barley, carrots, cabbage, zucchini, and canned tomatoes, and seasoned with plenty of onion, garlic, fresh parsley or Italian seasonings and the savory flavor of bay leaves. The crunchy and chewy texture of barley is warming and comforting in this easy homemade vegetarian barley and vegetable soup recipe. Although the recipe recommends that you simmer this barley soup for 30 minutes, it really is better if you have the time to let it cook even longer, as the flavors take time to develop. This barley and vegetable soup recipe is low in fat, vegetarian and vegan. If you like cooking with barley, you might want to try out a few more of my favorite vegetarian and vegan barley recipes, or, branch out and try some new-to-you whole grains and ancient grains, such as teff or kaniwa. There are many more vegetarian soup recipes to try! In a large soup or stock pot, saute the minced garlic and the diced onions in olive oil for 4 to 5 minutes, until just barely soft. Carefully add in the vegetable broth or water along with the barley, diced carrots, chopped cabbage, zucchini, crushed tomatoes, and bay leaves and bring to a slow simmer over medium heat. Next, add the fresh parsley or Italian seasonings, and a bit of salt and pepper. Reduce the heat to medium low, and cover the soup or stock pot. Allow the mixture to cook until the barley is soft, about 30 minutes, and preferably longer if you have the time, stirring occasionally. Taste, and adjust seasonings as desired. Remember to remove the bay leaves before serving. If you're not eating vegan, you may want to top this barley soup off with a bit of freshly grated Parmesan cheese when serving. Or, if you are eating vegan, try a hearty sprinkle of nutritional yeast on top.